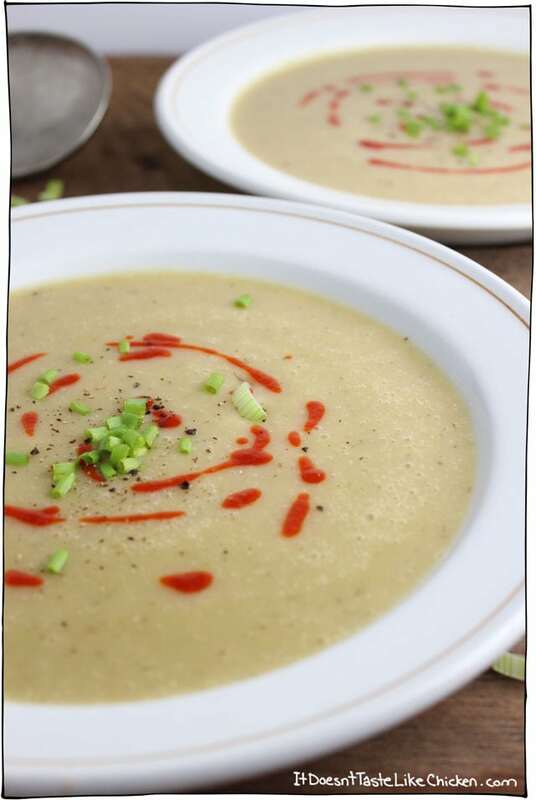 So when I made my Creamy Vegan Potato Soup, you guys were like, “helloooo put leeks in that bad boy”! Ok, I don’t think anyone specifically said that, but that’s the way it played in my head. So I did, I put leeks in that bad boy. More excuses to eat potato soup are always a good idea. I tend to make potato soup when I have nothing left in my fridge. When produce is low, let root veggies save the day! Potatoes are always there like the proud spuds they are. You may think that means I am hating on my potatoes, but maybe it’s an unconscious -save the best for last- strategy. Either way, I am never sad when it turns into a potato soup kinda day. 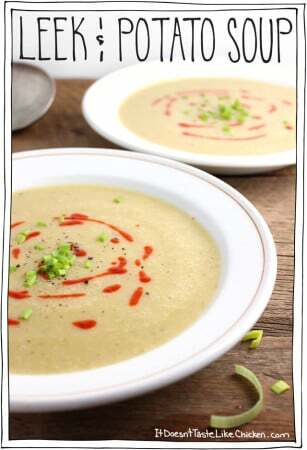 The Creamy Vegan Potato soup is richer and heartier. With the addition of coconut milk it has a wonderful creamy consitency. It’s fab for winter. 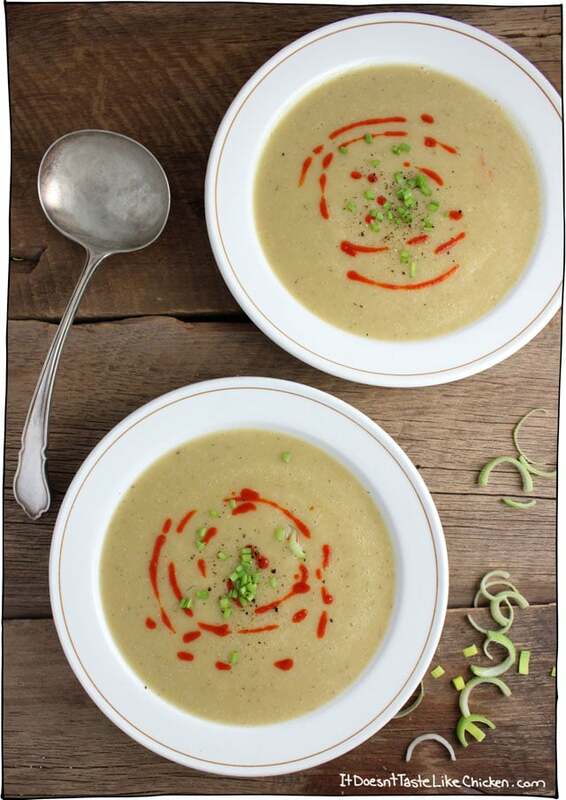 This Leek and Potato Soup, is a celebration of spring! A little lighter, a little fresher, a blend of bright ingredients. Top with a swirl of hot sauce just to give your tastebuds a friendly kick. 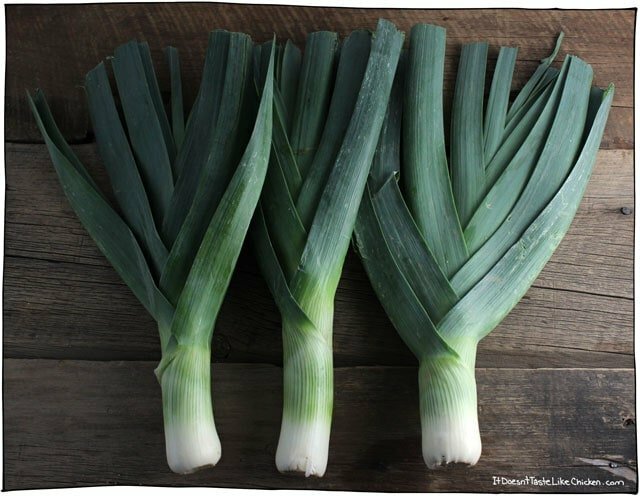 These ↓↓↓ are leeks, in case you didn’t know. Aren’t they pretty? They make a good fan if you ever get hot waiting in line at the register. (Be prepared for weird looks). If you aren’t familiar with leeks they are kind of like giant green onions. The pretty fan of leaves are the part you don’t eat, they are super tough, so bye bye pretty big leaves. 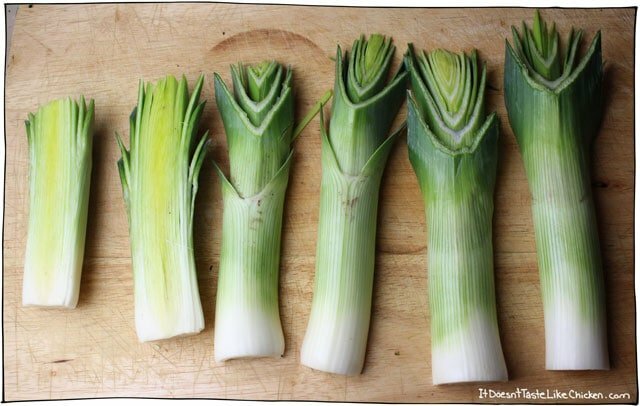 Cut off all the dark green parts, then slice the leeks in half lengthwise. Now peel the layers apart and make sure to wash in-between them. There is often dirt hidden between the layers. Sandy soup = Bad soup. 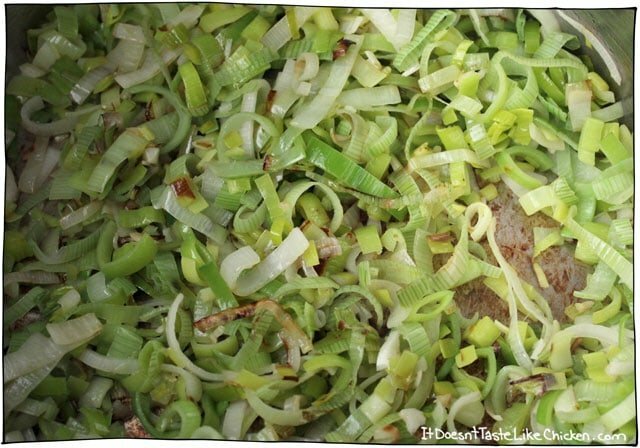 Slice up the leeks using the white and light green part of the leek, but not the dark green tougher leaves. Heat olive oil in a pan and toss in those babies along with the chopped garlic. Sauté them lightly until they start getting lovely golden flecks. Toss in the potatoes along with the rest of the veggies, the spices, and the vegetable broth, cover and bring to a simmer. Cook for about 2o minutes until the potatoes are easily pierced with a fork. Remove the bay leaf, then blend the soup to creamy deliciousness. If you prefer a chunkier soup, then blend about 1/3 of the soup, and then stir it back in. Mix in the unsweetened non-dairy milk, bring back to a simmer, and server with a drizzle of hot sauce (if desired) along with some some crusty bread. A lovely fresh soup for spring. Serve with a drizzle of hot sauce and some crusty bread. In a large soup pot, heat the olive oil over medium heat. Add the leeks and garlic and lightly sauté for about 10 minutes until softened and there are some browned bits. 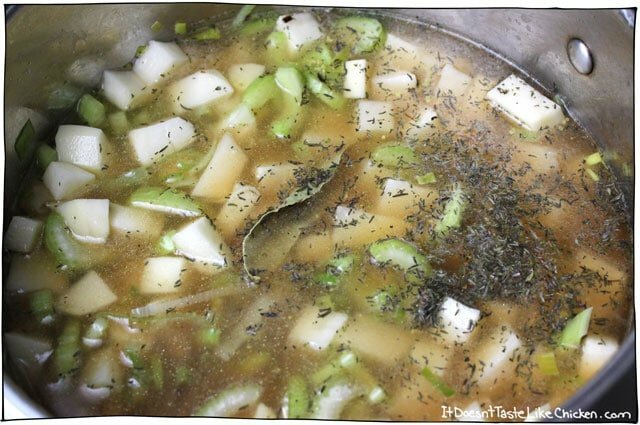 Add the vegetable broth, potatoes, celery, bay leaf, and thyme and to the pot. Cover and bring to a simmer. Let simmer for about 15 - 25 minutes until the potatoes are soft and easily pierced with a fork. Remove the bay leaf and then use an immersion blender to blend the soup. Alternatively, you can use a standing blender, blending the soup in small batches at a time. Be careful that hot soup doesn't explode out of your blender! Keep the batches small, and start at the lowest speed. If you like a chunky soup, blend about 1/3 of the soup and then mix back in. Return soup to pot, stir in non-dairy milk, and season to taste. Bring back to a simmer and serve hot. Featured Ingredient: Leeks. 57 Days, 32 Recipes to go! Great soup! I skipped the celery (because I dislike cooked celery almost as much as I dislike nutritional yeast). I also skipped the bay leaf and thyme (because I’m that lazy) but added garlic salt, which was a great choice. I only had 2 leeks and I wish I had more to really up the leek flavor. I did not peel the potatoes (again, lazy.) I used my immersion blender in the cooking pot, jumping around from chunk to chunk but left quite a few potato chunks for yummy fun. It wasn’t until bedtime that I noticed the splattered bits of soup on my shirt. Oh well, as I said, it was fun. Everyone in the house loved this soup! The perfect soup for winter or any cool, rainy days (which we have a lot of here in Scotland :D). It’s easy to make and really yummy. There really isn’t much else I could say, go and try for yourself. This soup is amazing, I cooked it today and I love it already, It’s so tasty and easy. Thank you for this recipe. another delish (and easy) recipe! i just made the leek and potato soup and am sipping it from a mug as i post this comment. simple, wholesome, and home-cooked food that tastes really good makes me happy; and i am so happy right now! 🙂 thank you!! We really liked this recipe. It’s super easy and flavorful. I added carrots to mine. Next time I think I will add some white beans as well for a little protein. Yum! Yummy… I love Leek & Potato soup… so this post was a perfect opportunity to make some! Thanks Sam. This is a great and simple recipe. I actually didn’t peel the potatoes, just scrubbed them very well – there are so many nutrients in the skin and it still blends up extremely well; and truth be told, I just plain HATE peeling potatoes! I also added a bit of dill at the end – just because I love dill. 🙂 Our 21 month old daughter LOVED the soup, she ate 2 servings! Potato leek soup is one of my favorites. I usually use almond milk so the coconut milk in yours has my attention. Yum! I love a good potato soup! I always tend to make soups when food is running low in our house too. It’s so easy to throw in whatever odds and ends are left from the week. Love it! Yes, exactly! A great way to rescue the remaining veggies, and it’s always so satisfying! Nice, I love potato soups. Spuds are so adaptable and delicious. The Sorrel is sprouting in our garden and I was thinking that it would be a great ingredient to use in your next tater creation. Sorrel tastes a lot like lemon and really nails the spring taste buds. Yum sorrel sounds yummy! I love lemony flavours.